New Rock Crawler type high clearance bumpers are tough and heavily gusseted for strength and great style. Fully impact tested to be compatible with your Jeep's airbag system. 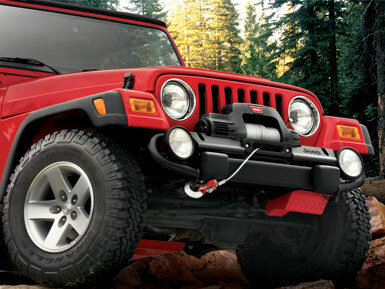 Front bumper features an integrated Winch mount, Tow eyes, Fog light mounts and protectors. The Rear bumper is styled to match the front and allows the use of Mopar/O.E. Tow hooks and trailer hitch. The Textured Black finish is E-Coated and Powercoated to meet the industry's toughest corrosion requirements. The Jeep logo is laser cut into both bumpers. Also shown is the optional Steering Box Skidplate. 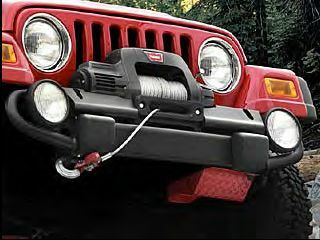 Satin Black textured finish, front "Rock Crawler" type bumper with intregrated winch mount, built in tow eyes and fog light mounts.